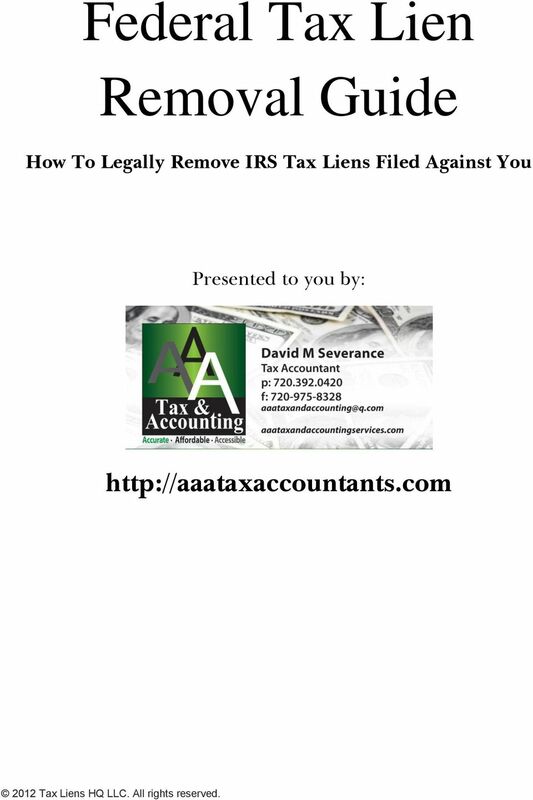 Download "Federal Tax Lien Removal Guide"
2 IRS Notice of Federal Tax Lien A Notice of Federal Tax Lien (NFTL) is an encumbrance that establishes a legal claim by the government. It does not result in the physical seizure of your property. A levy, on the other hand, allows the IRS to actually seize wages, cash, or property. In general, a tax lien gives the IRS a claim against everything you own, from your home and car all the way to the rusted bicycle in your backyard. The lien also technically attaches to your wages, money in you bank accounts, your retirement accounts, and even the cash in your wallet. A Federal Tax Lien also impacts your credit score, since it shows up on your credit report. Therefore, the tax lien can impact your ability to obtain loans, rent an apartment, and can even impact your insurance rates and ability to obtain employment if you are a job seeker. In most cases, a tax lien will jump ahead of many other liens against your property after a 180 day period, unless a particular piece of property is used as collateral for a loan. For example, a tax lien does not jump ahead in priority position over a car loan or a first, second, or third mortgage against your home. It will, however, usually jump ahead of, say, a mechanic's lien against your home. You may have circumstances where having the lien released would be of benefit to helping you resolve the tax situation. There are three types of lien releases available to a taxpayer that may help you resolve tax liabilities with the IRS. 3 Certificate of Discharge A Certificate of Discharge (COD) is the process of removing a single piece of property from being subject to the tax lien, usually so that the property can be legally transferred. For example, if you are trying to sell your house but the presence of the lien is preventing this from occurring, then you would need to obtain a Certificate of Discharge to release the tax lien against your house. In the vast majority of cases, the IRS will not release a lien against a particular piece of property unless they are somehow going to benefit from it. They will generally approve a Certificate of Discharge if the lien discharge will facilitate the sale of the property in such a way that the IRS will get some money out of it. In other words, releasing the lien will facilitate collection of the tax. If the government isn't going to see any money out of releasing a piece of property from the lien, it's possible to still obtain a Certificate of Discharge if there is a valid reason. 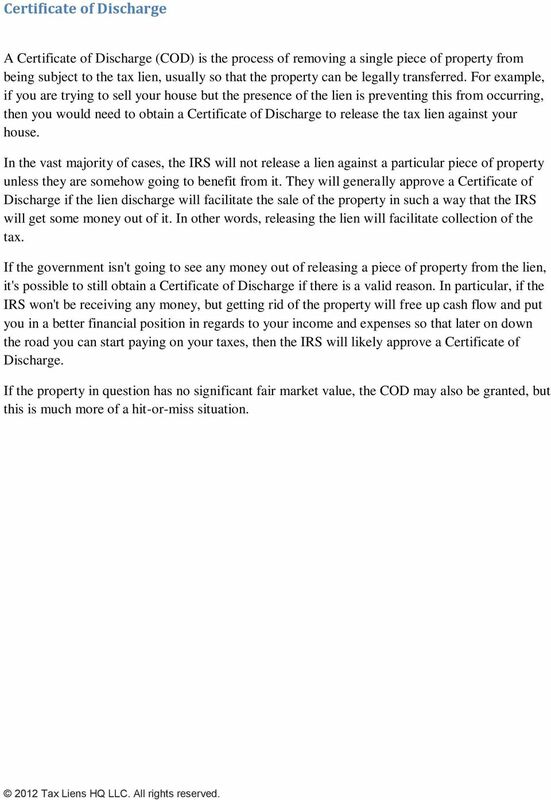 In particular, if the IRS won't be receiving any money, but getting rid of the property will free up cash flow and put you in a better financial position in regards to your income and expenses so that later on down the road you can start paying on your taxes, then the IRS will likely approve a Certificate of Discharge. If the property in question has no significant fair market value, the COD may also be granted, but this is much more of a hit-or-miss situation. 4 Lien Subordination A lien subordination is the process of moving the tax lien down a notch in the prioritization of claims against a piece of property. For example, if you own a house free and clear, and the tax lien is in first position against the house, you can't obtain a mortgage against the house. No lender in their right mind is going to loan you money against that house unless their lien is going to take first position. The answer to this problem is the lien subordination. The IRS will usually approve the subordination of their lien against a property if the lien that will be taking first position ahead of the tax lien will result in money going to your tax liability. In the house example, obtaining a subordination of the tax lien in order to obtain a mortgage against the house will result in cash coming from that mortgage. 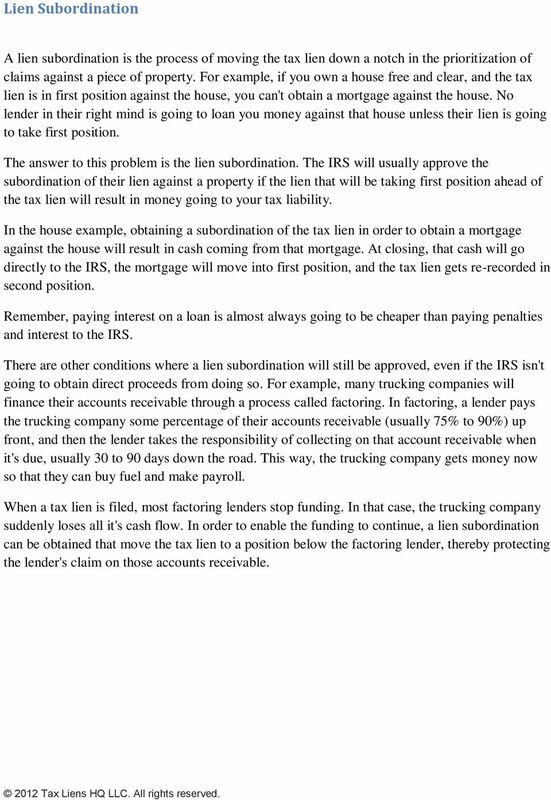 At closing, that cash will go directly to the IRS, the mortgage will move into first position, and the tax lien gets re-recorded in second position. Remember, paying interest on a loan is almost always going to be cheaper than paying penalties and interest to the IRS. There are other conditions where a lien subordination will still be approved, even if the IRS isn't going to obtain direct proceeds from doing so. For example, many trucking companies will finance their accounts receivable through a process called factoring. In factoring, a lender pays the trucking company some percentage of their accounts receivable (usually 75% to 90%) up front, and then the lender takes the responsibility of collecting on that account receivable when it's due, usually 30 to 90 days down the road. This way, the trucking company gets money now so that they can buy fuel and make payroll. When a tax lien is filed, most factoring lenders stop funding. In that case, the trucking company suddenly loses all it's cash flow. In order to enable the funding to continue, a lien subordination can be obtained that move the tax lien to a position below the factoring lender, thereby protecting the lender's claim on those accounts receivable. 5 Lien Withdrawal There are rare occasions when obtaining an outright release of the entire Federal tax lien is actually the best way to progress towards a resolution of your tax liabilities. If a case can be made that the withdrawal of the lien will facilitate payment of the tax liability, or is otherwise in the best interest of both the taxpayer and the government, then the government may be open to this. Another case where a lien withdrawal can be applied for is when you have entered into an Installment Agreement to pay the back taxes and the agreement did not mandate that a lien be filed, particularly a payment plan where the payments are directly withdrawn from your bank account. In these cases, you can often get the lien released as long as you are current with your payments and other tax obligations. 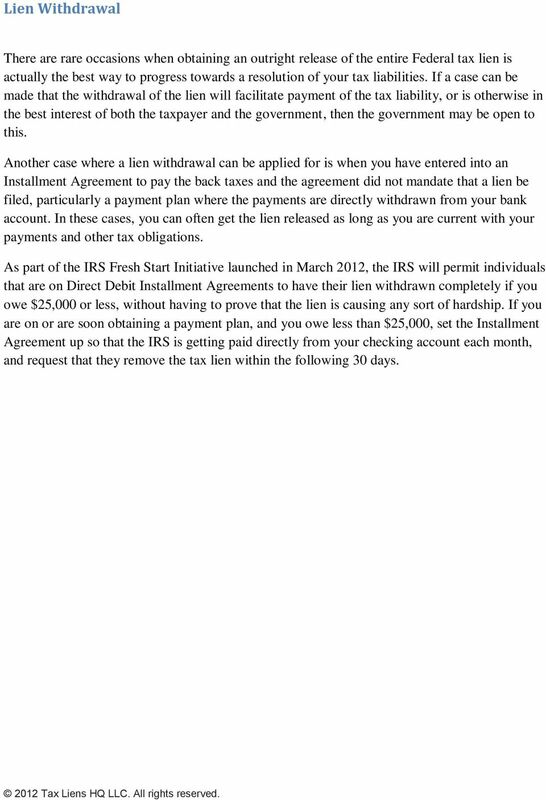 As part of the IRS Fresh Start Initiative launched in March 2012, the IRS will permit individuals that are on Direct Debit Installment Agreements to have their lien withdrawn completely if you owe $25,000 or less, without having to prove that the lien is causing any sort of hardship. If you are on or are soon obtaining a payment plan, and you owe less than $25,000, set the Installment Agreement up so that the IRS is getting paid directly from your checking account each month, and request that they remove the tax lien within the following 30 days. 6 Certificate of Release of Paid or Unenforceable Lien The IRS is required to issue a certificate of release of lien no later than 30 days after one of the following events occur: The tax liability is paid in full. 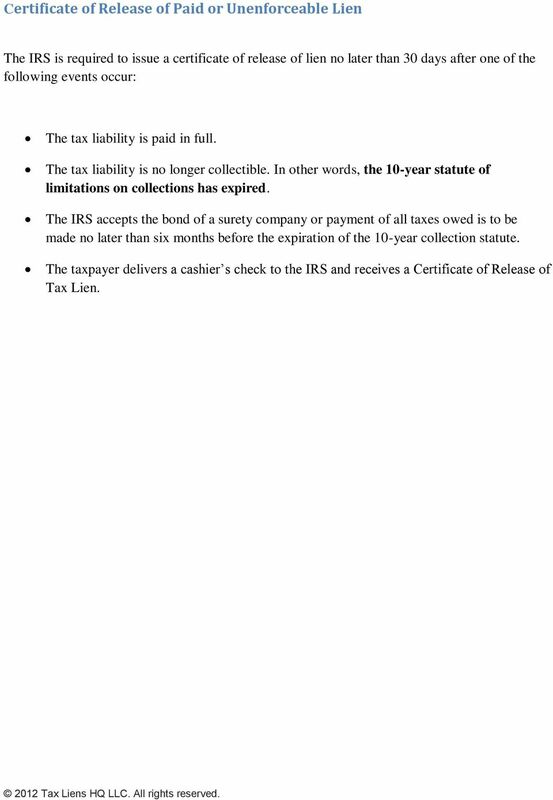 The tax liability is no longer collectible. In other words, the 10-year statute of limitations on collections has expired. The IRS accepts the bond of a surety company or payment of all taxes owed is to be made no later than six months before the expiration of the 10-year collection statute. The taxpayer delivers a cashier s check to the IRS and receives a Certificate of Release of Tax Lien. 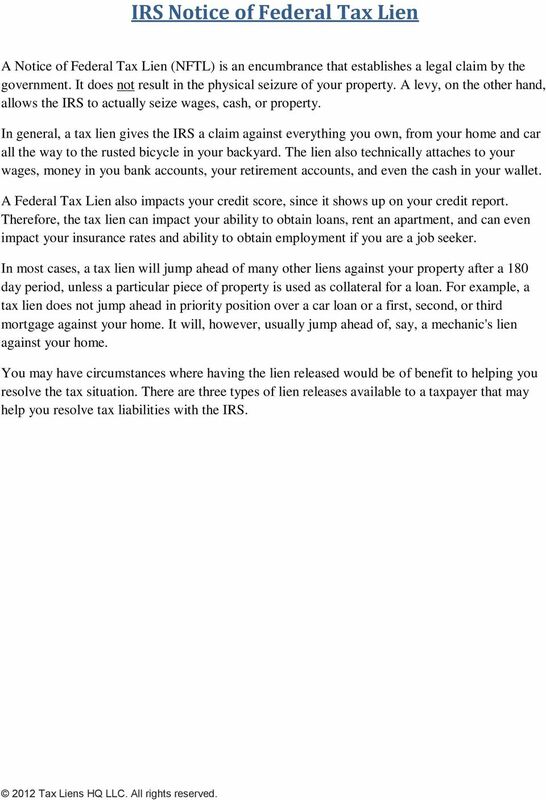 Take a Liability Risk Quiz: How Well Do You Know Hidden IRS Pitfalls When Lending? 1. I have something called a Chapter 13 plan. What is that exactly? All the Things the IRS Can Take Even Retirement Accounts! Tired of the Foreclosure Threat? Are you in debt? Do you need to sell your house fast? Then Read on to find out How To Get Out Of Debt Now! Understanding how chapter 13 bankruptcy works: Creating a plan for. dealing with unique financial challenges. Bankruptcy. Debts & Debt Collection. What happens if I can't pay my bills? What can a collection agency do? How is a secured debt collected? Account a service provided by a bank allowing a customer s money to be handled and tracks money coming in and going out of the account.